At first, I thought NEO Shimmer series was the same thing as NEO Princess since they both have the same size in diameter as well as the natural tri-color designs. You can see they are indeed similar but different. 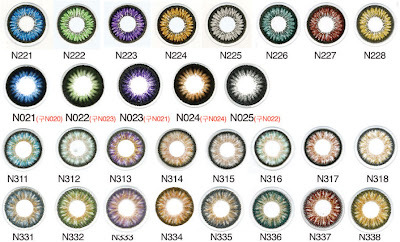 Shimmer series has soft black outer rims with two other colors cleverly mixed. The light brown colors in the inner area blend in very well with my natural eyes leaving a bit of green nuance. I actually prefer the Shimmer series over Princess cause I personally think the colors blend in better with my eyes and they look not as opaque as Princess. This particular color blue is quite bright but it is still on the translucent side, which makes it more wearable in my opinion. 14.2 mm is perfect to my preference. They feel very thin and comfortable. At this point, I am only buying NEO lenses especially for that reason. I know I said this is my least favorite of the series, but I really like the color and design of this. I don't think blue contacts are the best for Asian complexions and they do often look cartoonish and weird. This Shimmer Blue does have a bit of the unrealistic character to it and I notice people stare when I wear them during the day, but it has the best of both worlds of artificial and natural thanks to the semi-sheer color and natural design. What do you think about blue color contacts in general? What is your favorite way to wear them? You make me want to try NEO too! Wow these are beautiful on your eyes. ;_; If they're your least favourite, the others must be beyond spectacular! Oh wow, they are super intense! I love them on you! I have never tried circle lens, but I do want to try green and gray and purple, because I think it'd be fun! I'm a little worried, though, since I wear regular prescription contacts daily. Ah, well. You look beautiful! I actually like the blue - it's fun but not *too* cartoony. They look gorgeous on you. I haven't tried any though. I think they would look great with aqua eye shadow, color would really pop out. least favourite?let's see what the rest of them look like..when i saw this the first thought that came to mind was that of green palm trees against a clear blue ocean..which i love.. It really stands out! I love the mix of blue with green, very pretty for spring and summer! Can't wait to see what the other two colors look like on you. And thanks for the comparison chart, so helpful! wow..i love colored lens...especially green ones!! I don't care if they're your least favorite-- I love them. :) I am going to be getting a contact eye exam one of these days because I want to wear colored contact lenses!!! Your reviews and photos just are sooooo tempting! i'd recommend NEO brand since they have higher water content and feel very comfortable. i really like the Shimmer series a lot. Honey color is my current top favorite and it looks even more natural. i will review them soon. thanks for your sweet comment, Carla! Wow, what beautiful colours. The first photo definitely shows the design and colour well. I really want to try this series.. I have to agree about the lighter coloured lenses with asian eyes, however I don't think it's impossible to pull off! i see NEO lenses are based on the same color palettes and they seem to work for me pretty well. the company i mentioned provides superb customer service. i wish they carry more designs, though. my favorite of the season is the Honey color and it is awesome. i am sure you will love it, too! Honey and Green of the series look so much more natural on me. i'd highly recommend NEO brand. it is my favorite. nowadays i stick with brown and subtle grey colors but it is fun to wear some bright colors like this sometimes. ooh Shimmer Blue is just too gorgeous!! love the lovely yellow inner ring. 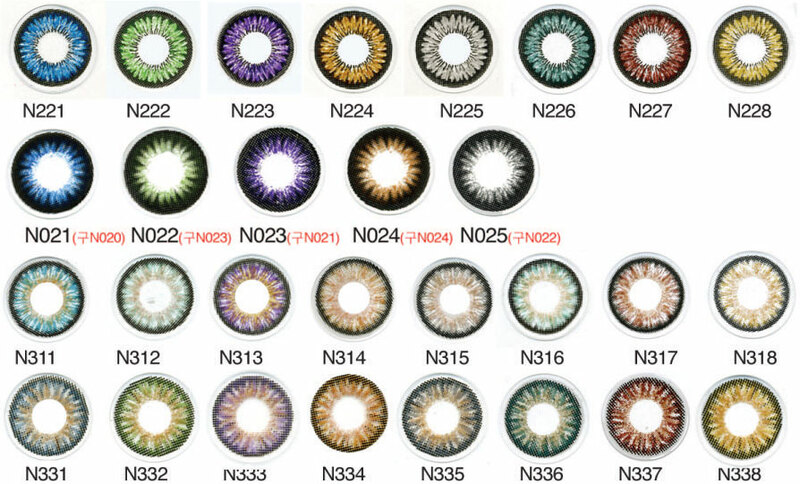 it helps create a really beautiful multi-toned effect overall <333 don't tempt me to get more circle lenses haha!! yeah i still think twice before i reach for a blue pair but it is fun to wear them sometimes. awww Dovey, what a super comment! ;D thanks!! awww i am sorry to hear that. maybe disposables with more warter content would work? haha i'd be glad to enable you, Izzy! Pretty Pretty! I love colored contacts, but I can't wear them as I have bad eyes that don't wear colored ones too well. Looks great on you though. those contacts are pretty. your skin also looks very nice! wow i've never seen lenses this color before. reminds me a bit of Avatar hahahha you look beautiful!!! i've been so lazy with blogging lately. that blue and green on you is just GORGEOUS Lena! Love the dual color combination.